I did not know Watership Down was only published in the 1970s. For some reason, I always assume books of this nature were written very early in the 20th century. I also didn't know that Watership Down had political commentary in it about the way governments are run, but it does. What is with me recently and reading all these books about political activism? Animal Farm, The Jungle, etc. It is a lot of heavy reading to close out the year. In case you don't know the story, Watership Down is about a group of rabbits who leave their warren and try to establish a home of their own. They encounter all sorts of dangers and mishaps along the way, and set out to save other rabbits as well, mostly those who have lost their wildness due to poor ruling. Many people have recommended Watership Down to me as one of their favorite books of childhood. They also really love the movie. I was pretty excited to read the book even though I generally don't love books that are written from the point of view of animals. But I decided that if SO MANY people love this book, then I should read it and know what all the gush is about. I wonder if this is the sort of book you read as a child and then love for the rest of your life because of how immersed you become in the story and the lives of its characters. Much as I felt about Anne of Green Gables, as I begged my parents to take me to Prince Edward Island for vacation. (Alas, they did not do so as no one else wanted to go there.) But I don't think I'd fall in love with Anne Shirley if I were only to be introduced to her now. I think I'm past the age when her life seems idyllic and wonderful enough to me that I would want to fully immerse myself in it as a character in the series. And I think that's what happened with me for Watership Down. Honestly, the only thing I kept thinking while reading it was, "Seriously, this story isn't over yet?" I kept thinking that FINALLY the rabbits had made it past a crisis, and then I'd look at my audiobook progress and I was only about 50% of the way done with the story! It just wouldn't end. Maybe I didn't love the book because I did it in audiobook format. There was nothing wrong with the narrator, really - he did a lot of different voices and accents and such. But a lot of the book was fighting scenes and such, and those never appeal to me and I would have liked to flip past those pages (of which there were several) and get onto the next part. Also, in his forward, Richard Adams talked about how he wanted to make his rabbits as realistic as possible. This basically meant that for much of the book, females weren't mentioned and when they were, they were spoken of as objects for reproductive purposes only. Maybe this is how rabbits really DO act in the wild, but Adams was perfectly fine with having them chat with each other and set up dictatorships and become friends with birds and escape in boats, so I think he could have had a bit more leeway on the female front. Anyway, this one wasn't a great success for me, but I'm glad I read it. I do feel like this book has a lot of cultural relevance, so I'm glad I've read it and now understand that it is about a group of animals (and not, er, a battleship/submarine battle, which is what I grew up thinking it was about). I'm wondering the same thing, that maybe I'm past my prime for books like this one. Do you think it is anything like Animal Farm? I loved the latter and only read it couple of years ago. 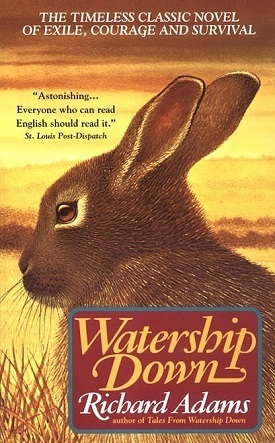 It seems like with certain books if you haven't read them as child, you won't love them as an adult.I haven't read Watership Down yet but your post makes me think I should read it. It might be something to share with my kids. Books like this I pass on to my daughter. I don't think I ever really cared for books written from an animal's point of view, she however loves them. I had no idea this was only from the 1970's either. My sister wanted it for Christmas, but I haven't got around to reading it myself. Maybe one day! I'm one of those people who love Watership Down and consider it a childhood favourite, but I can see that reading a book for the first time as an adult is a completely different experience from reading it as a ten-year-old! Oh, no! But JENNY says that she read it as an adult and loved it! I think it's all a function of your expectations going in. That, and that Watership Down could never possibly be a good audiobook read. I'm not saying that as a criticism; some books just aren't suited to it. I read Watership Down as an adult, so read-it-as-a-kid-and-now-nostalgic doesn't explain my love for it. But I went into it with NO expectations, and I think that made a huge difference. I thought it was going to be dumb, and instead it was so exciting. Sorry you didn't like it! :( I feel that I contributed to your disappointment by loving it so much! Not at all! The only contribution to my disappointment was myself - and, as you say, perhaps the fact that I read it as an audiobook. But it seemed like it WOULD succeed as an audiobook! Just because of all the excitement! I quit on this one in disgust a few years back when I realised the female rabbits were never going to get any attention paid to them. Plus I was bored too. ;) And I find the author's statement in the preface even more obnoxious as a possible justification for such sexism. Hmph. I read this in high school. Generally I enjoyed stories from an animal's point of view, but I felt I really didn't "get" this one at the time, but it's possible I would enjoy it now perhaps? Though the invisibility of the female rabbits would annoy me.